They were 150 Navy officers on a mission. 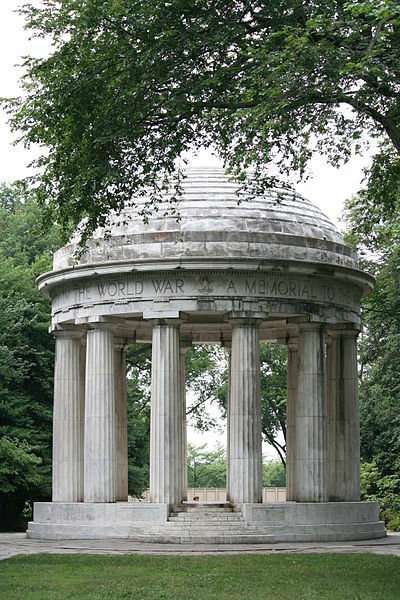 Yet, their task fell after the Armistice of November 11, 1918, which ended the fighting of World War One. Their objective was to help defeat the enemy “that knows no Armistice:” hunger. War destroys food production. Farmlands, factories and roads, all the things you need to produce and move food can be leveled by just one battle. These cannot be fixed overnight. Even if all guns go silent, hunger can continue to attack a population. The consequences of malnutrition, particularly for children, can be deadly. This was certainly the case in Northern France, which had suffered through years of German occupation and fighting during World War One. When the Armistice came civilians, who had been forced to flee, now wanted to return to their homes. What would be left of them? As Herbert Hoover described in his memoirs there was tragically little remaining of these homes and villages. There was very little food supply as well. Then came the Navy to save the day for the refugees. These were 150 volunteers under Admiral Thomas Craven. They came ready to work. Hoover and newspaper accounts describe how almost overnight these men put up barracks near the French villages that had been destroyed. Next they put beds and kitchens inside these structures. Imagine a family trekking along a road toward their home, tired and hungry. Thanks to the Navy they could find food and a place to rest. This aid would be needed in the weeks and months ahead as they tried to rebuild their lives and towns. The Commission for Relief in Belgium (CRB) had provided aid to Northern France during the war. A lot of the American staff though had joined the U.S. Army. Once the armistice came, these officers returned to their duties with the CRB to fight hunger. In the coming years CRB and American Relief Administration officers, with support from people back home, fed millions of people. These are lesser known tales of heroism from those who have served in our military, but for the greatest of causes. This humanitarian tradition continued into the Second World War. So many tales of heroics from the 1945 airlift to the starving Dutch in Nazi-occupied Holland to U.S. Army led school lunch programs for Austrian and German children. The U.S. Air Force also evacuated Korean war orphans who were trapped by the fighting. They flew them to safety on an island away from the approaching enemy. The Air Force made a return visit later to the orphans bringing food and gifts from the American people. These meals can save and change a life forever. In President Woodrow Wilson’s proclamation of Veterans Day he said America has the great opportunity “to show her sympathy with peace and justice in the councils of the nations…” That is our best hope to for spreading peace across the globe. We know that hundreds of millions of hungry and sick people around the world is not peace. It is certainly not the peaceful world that veterans of World War One hoped to see come about. Yet as we speak people are starving and displaced from wars in Syria, Central African Republic, South Sudan, Sudan, Afghanistan and many other parts of the globe. On this Veterans Day we can remember the many who have served in the armed forces and built a great humanitarian tradition. A tradition that carries on. Tagged as Armistice Day, history, Veterans Day.